Thank you Lord for your presence in the choices and the struggles of this day, for allowing me to stumble into you this evening. Thank you for the gentleness, with which you surround me in this evening’s silence. May it penetrate and settle my thoughts and feelings. I offer you this day gone by, with all its challenges, opportunities, setbacks and my pessimism. May I accept both the success and failure I have met today. Help me to remember not to break the bruised reeds of the day, but deal gently with all that has happened. Lord, I pray for those who are in need of the basic things in life. — Help me to respond practically and raise awareness of their need. Lord, I pray for all who have touched my life in confusion or pain today specially those with pessimistic ideas. — May I be honest and gentle with what is damaged in others. Lord, help me to trust your quiet and gentle presence. May I live in the rhythm of your goodness tomorrow, and find you in the quiet and simple pauses in my busy day. May I put others in touch with your presence through my gentleness and friendliness to all. May I be able to help those pessimist souls showing them that future really exist and that in the future there is hope. A Blessing for family and friends, be with them in this evening — with your gentleness. As they see what they have achieved — bring them your humility. As they look towards a new day — bring them your optimism, in the name of Jesus Christ our Lord we pray. Amen. As Sunday slips away, my mind turns towards a new week, where God meets me. Be with me Lord, this evening, prepare me to recognize your presence, in the normal and novel events of a new week. Heavenly Father God, stay with me as I begin a new, untouched week. As I unwrap the gift of each day, help me to trust you in all that I find, and give thanks for the privilege of living in your presence. I ask this through Christ, the Lord of all time, and my companion on each day’s journey. A Blessing for Family and Friends Bless them with rest to renew them in strength and faith. Guide them in the week that lies before them. Draw them close to yourself each day. 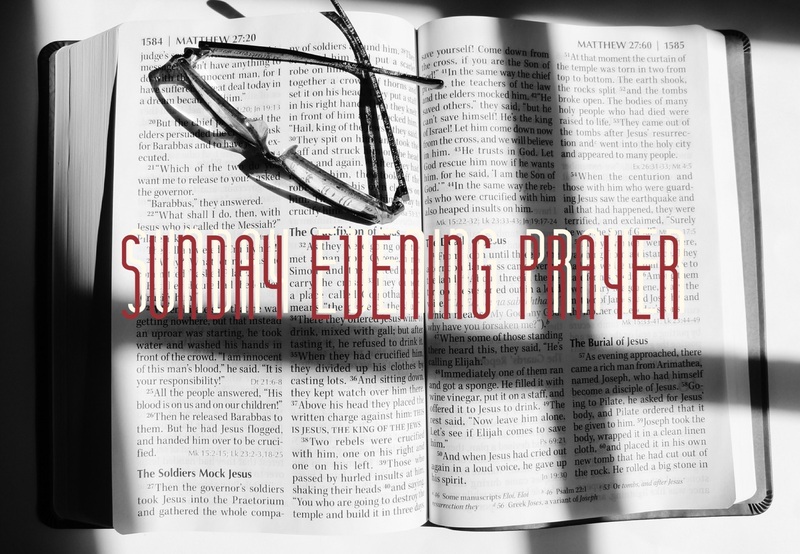 Listen to our prayer tonight in the name of our Lord and Savior Jesus Christ. Amen.